A short and sweet glimpse into Cornwall's beautiful coastline. This gentle tour takes in some of Cornwall’s most scenic coastal cycling. Covering the far west of the county, highlights include the picturesque fishing village of Mousehole, Porthcurno and the Minack Theatre, and vibrant art scene of St Ives. Cycle hire: Add £45 per person. Electric cycle hire: Add £120 per person. Find out more about our bike hire here. Scroll down for tour highlights. Click the arrows on the timeline to see the tour. Check in for your first night’s accommodation at The Commercial Hotel, St Just. St Just is England’s most westerly town and the area has been awarded World Heritage status in recognition of the mining industry. Nearby Cape Cornwall is a short cycle ride away from the hotel. If you are hiring a cycle for the tour, we will set you up and make all the necessary adjustments in the afternoon of your arrival, to ensure you are ready to go in the morning. A former coaching inn, the Commercial Hotel in the centre of St Just has been run by the same family for over 100 years and is well-known locally for its warm, Cornish welcome and excellent home-cooked food. 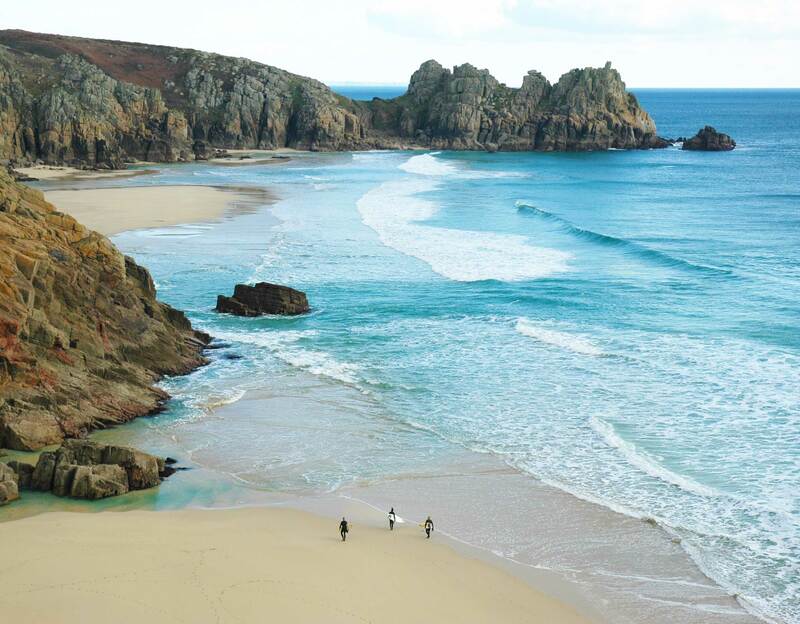 Located a mile from Cape Cornwall, the area is rich in Cornish culture and heritage, with ancient Celtic sites and abundant hidden coves, with easy access to the popular beaches at Sennen Cove Beach and Porthcurno. All 11 bedrooms are en-suite, with televisions, hair dryers, and tea and coffee making facilities. Leaving St Just, the tour follows lanes which hug the clifftops of the north of Cape Cornwall and Poldark country. 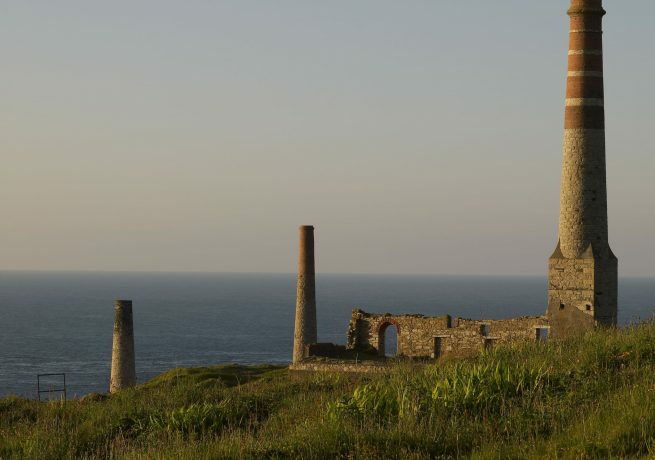 The area’s mining heritage is clearly visible here, with engine houses and ruined mine workings still standing at Botallack and Levant, and the Geevor Mine museum at Pendeen. The route then takes you through National Trust land at Rosemergy, Porthmeor and Gurnard’s Head to the village of Zennor, where the nearby Logan Stone is worth a detour. 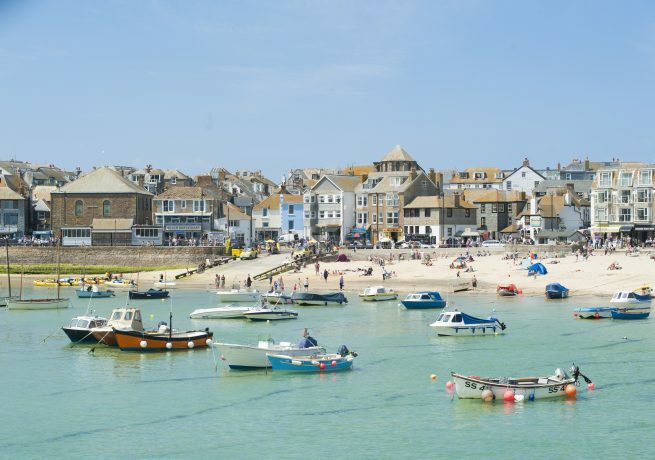 Then on to St Ives, which is well known for its artists, the Tate gallery and the Barbara Hepworth Museum, as well as being home to some great restaurants and a picturesque harbour. The Queens Hotel, St Ives The Queen’s Hotel is a late Georgian, three storey building in the heart of picturesque St Ives. Eight en-suite bedrooms have been redecorated with vintage furniture and Cornish artwork, plus sparkling new bathrooms with new showers. Downstairs is a relaxed and friendly bar with delicious pub food made from the finest local, seasonal ingredients Cornwall has to offer. From St Ives to Hayle the route follows the coastal road with wonderful views over St Ives Bay and up to the lighthouse at Godrevy Head. From the estuary at Hayle (a renowned habitat for wading birds), you’ll cycle from the north to the south coast of Cornwall at the county’s narrowest point. 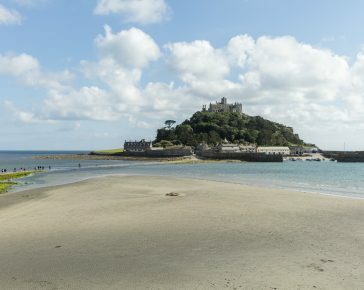 St Michael’s Mount makes an ideal spot to rest for lunch, and from there it’s an easy, level ride around Mount’s Bay to Penzance and neighbouring Newlyn. Both towns have large harbours and big fishing fleets, so there is always plenty going on there. 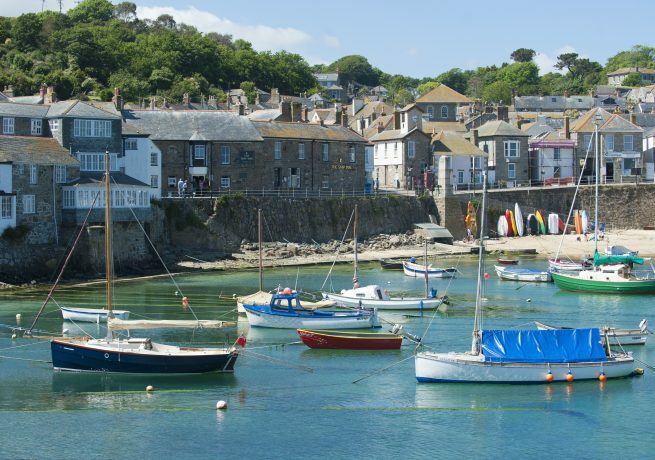 The final stop of the day is Mousehole, a cosy fishing village with real charm and character. The Ship Inn, Mousehole The Ship Inn is right in the heart of this traditional Cornish fishing village. Of the eight double en-suite rooms (all with showers), six overlook the harbour and have sea views. As a result, The Ship Inn has been awarded four stars by Visit Britain Quality in Tourism Rating. The food served at The Ship Inn makes use of the abundance of fantastic seafood in the local waters, so be sure to grab a bite to eat here. Cornwall’s mining heritage is clearly present around St Just. Riding north along the coast through Botallack, the spectacular cliff scenery is studded with mine engine houses and chimney stacks on the cliff edges, which was the perfect setting for some scenes in the television show Poldark. There is also a dedicated tin mining museum at Geevor. Because all our tours are created around your preferred start dates and party size, we have a two stage booking process. 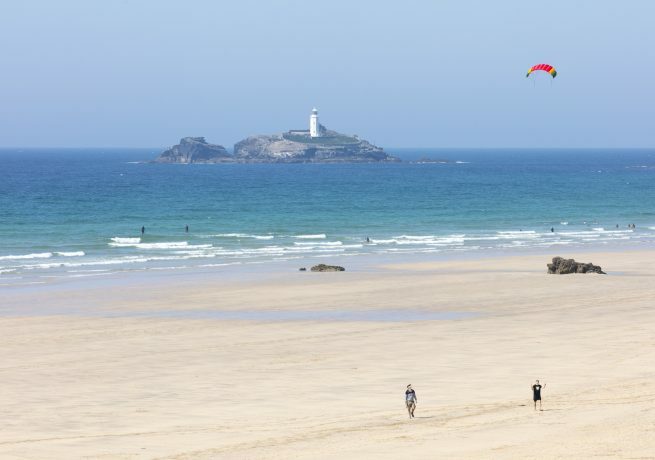 With white sand and turquoise waters, this award-winning beach is a little piece of paradise, and is famous for its connection with BBC One’s Poldark. 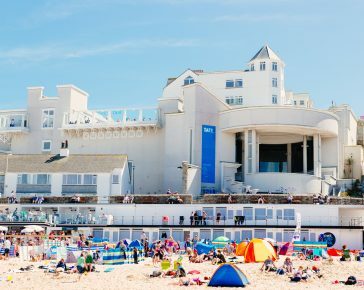 The iconic Tate St Ives sits overlooking Porthmeor Beach, exhibiting work by modern British artists. Situated on a rocky island in Mounts Bay on Cornwall’s west coast, this iconic medieval castle is famous for its granite causeway which appears at low tide.